Discussions Magazine Music Blog: THE DOOBIE BROTHERS revisited: SPAZ reviews the Warner Bros. Years box set! 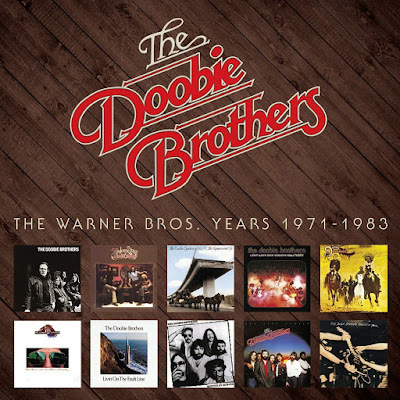 THE DOOBIE BROTHERS revisited: SPAZ reviews the Warner Bros. Years box set! The Doobie Brothers are the personification of Americana music. I am aware that they don’t fit the description of what is normally perceived as an Americana band in 2015, but let’s look at the facts. First off, this is how Wikipedia describes ‘Americana Music’: “Americana is an amalgam of roots music formed by the confluence of the shared and varied traditions that make up the American musical ethos; specifically those sounds that are merged from folk, country, blues, rhythm and blues, rock and roll and other external influences.” I’d say that description also fits The Doobie Brothers pretty darn well. Along with Creedence Clearwater Revival and The Band, The Doobies were one of the few American ‘Classic Rock' bands to blend numerous homegrown genres together into a hearty musical stew and sell loads of records doing it. While they may have been fans, the Doobies skipped the British Rock influences of their contemporaries and focused on all the music that grew from U.S. soil. The multi-racial band didn’t form in the mid-west, deep south or in the smoky mountains – they were Northern California-based. However, their music really ‘felt’ like the band had crawled straight out of the heartland and into the charts. They had soul, they were funky, they were down-home and they rocked. There was absolutely nothing insincere about The Doobie Brothers – they were truly one of the most authentic American Rock bands of their generation. While a hits collection is going to give you all the songs that you are familiar with – “Listen To The Music,” “Black Water,” “China Grove,” “What A Fool Believes,” etc. – The Warner Bros. Years: 1971-1983 puts you right back into the middle of the action and reveals the band’s growth and influence over the course of 10 original albums. It is nice to experience those hits in a new light - by revisiting them in their original context as album tracks. The debut album from ’71 introduced a band that was unique but still finding their footing. By the second album, Toulouse Street, the band expanded their musical vision with the addition of new members and settled into their groove. With Tom Johnston and Pat Simmons as their main creative forces, the band crafted some amazingly varied albums that explored new avenues while never straying too far and losing their audience. For a while, The Doobies were unstoppable. A lot of credit goes to producer Ted Templeman, who twiddled the knobs on all 10 albums included in this set. He knew how to harness their diversities and focus their energies on creating delectable aural slices of American Rock. Over forty years after their first album, the Doobies are still extremely popular but don’t get nearly as much respect as they deserve. And to be honest, that might be because there were two phases of the band’s career: “The Tom Johnston Years” and “The Michael McDonald Years”. There was a brief period when both were in the band together, but essentially, when the Rock ‘n’ Roll lifestyle wore Johnston out, the band brought in Michael McDonald to fill his boots. Johnston was a rocker with a funky edge so it was initially shocking when they brought in McDonald, who was a Blue-eyed Soul singer with Jazz and Rock leanings. Both of them were enormously talented but worked on different ends of the musical spectrum. During his time in the band, McDonald steered the Doobs away from the swamplands and into the suburbs – which was a direction that older fans did not appreciate. On the other hand, with McDonald, they were more commercially successful than ever. No matter which era you prefer, the band’s entire career brought some astounding music. Sitting back and listening to these albums again will remind you of that. While I have owned these albums in the past (apart from the 1983 live album), it’s nice to have them combined into one set. Each CD comes housed in a mini LP sleeve (four of which are gatefolds, replicating the original vinyl release) and all are packaged in a nice flip-top box. If the album came with a printed inner sleeve (lyrics, photos, etc), those are now inserts in the mini LP sleeves. There are no additional booklets included but that is hardly a complaint – the music will tell you everything you need to know.